The Guyanese visit coincided with a key milestone in the efforts of Guyana and EU to tackle illegal logging and associated trade — on 23 November, representatives of each side met in Brussels to initial a Voluntary Partnership Agreement (VPA), which aims to improve forest governance and promote trade in legal timber products. Even before the VPA was agreed it has had positive impacts, say members of the Guyanese delegation. They note that the VPA negotiation process has improved consultation in decision-making processes, strengthened coordination among government agencies and led to skills training for officials and the private sector. They expect that when the agreement is fully implemented it will improve access to the EU market — for both large companies and small-scale producers — by guaranteeing the legality of timber products and so meeting the EU’s stringent regulatory requirements. By promoting legal trade, the VPA is expected to support sustainable forest management and help Guyana to modernise its timber product sector, allowing the country to add value to its exports and make more money from fewer trees. Members of the Guyanese delegation also highlight the potential of the VPA to create new jobs and improve existing ones. To implement the VPA, Guyana will develop systems and procedures for verifying the legality of timber products throughout the supply chain, from the forest or point of import to the point of export or domestic market. Experiences from other countries that are already implementing VPAs with the EU suggest that this is likely to take several years. While in Belgium, the Guyanese delegation met with customs authorities, policymakers and nongovernmental organisations. The aim was to learn about European needs and concerns, and to understand similarities and differences between regulatory control systems at each end of the timber trade. Despite the challenges ahead, Guyana considers the VPA to be worthwhile because when it is fully implemented, all of the country’s timber exports will be verified to be legal. They will automatically meet the requirements of the EU Timber Regulation. This means that importers will be able to bring them into the EU and place them on the market without first doing onerous and costly due diligence checks. 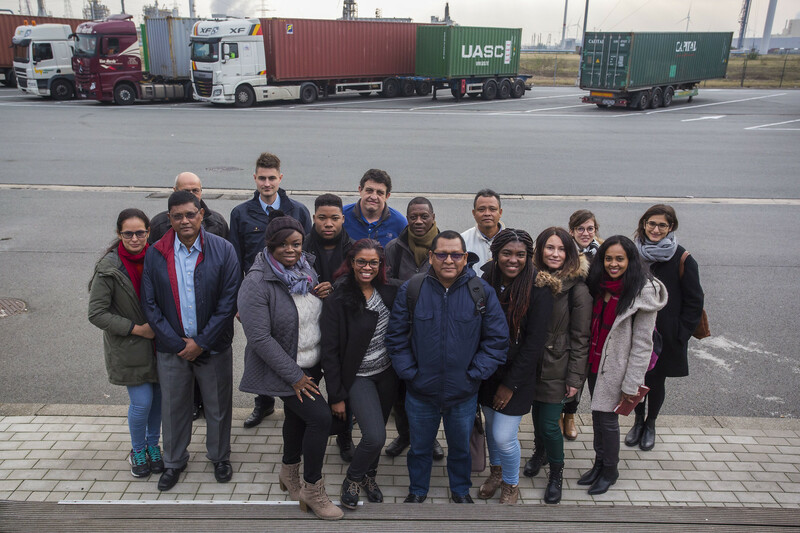 Photographs from the Guyanese delegation visiting the port of Antwerp, Belgium. Source: Javier Bernal Revert, EU FLEGT Facility.